Healthcare costs too much. We’re all in agreement on that. But in reality it costs far more than most people imagine. The cost of healthcare has been rising for decades. 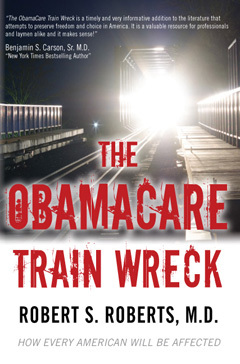 ObamaCare was supposed to fix that. In reality, it only made it worse. 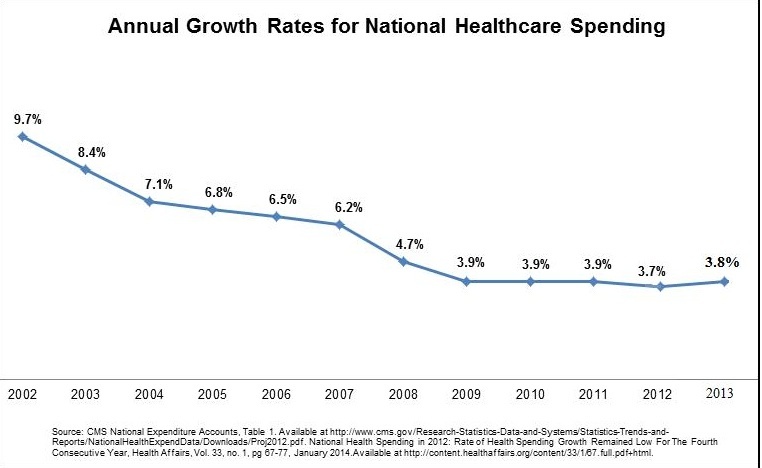 While national healthcare spending was declining steadily, it now is rising once again. The graph below shows the pattern of national healthcare spending before and after the implementation of ObamaCare. 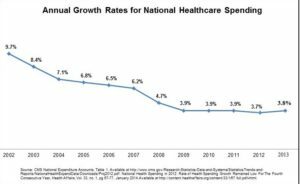 It shows that the rate of growth of healthcare spending was declining in the years just prior to passage of the Affordable Care Act (ObamaCare) in 2010. The new healthcare law didn’t actually take effect until 2014. Since then, healthcare spending is rising again, to 4.3% in 2016 according to the Centers for Medicare and Medicaid Services (CMS). Most people don’t care much about trends in national healthcare spending. They only care about how it affects their own pocketbook. So what is the real impact on the individual? Corporate concern for the rising costs of providing healthcare coverage to employees has prompted three major corporations, Amazon, Berkshire Hathaway, and J.P. Morgan, to form a cooperative non-profit venture to try to lower these costs. These businesses aren’t doing this out of charitable interests. They want to lower their corporate expenses and therefore raise their corporate profits. There are many skeptics of this approach and I have mentioned these in an earlier post called AmazonCare – The New Solution? Employees of these corporations might believe this new venture, if it succeeds at all, will only benefit the shareholders and not them. Here is where they are wrong. The real cost of healthcare is not only what it costs out of your pocket every time you go to see the doctor. It must also be measured in the total cost, not only of the treatment, but for the insurance that partially covers that treatment. The biggest problem in solving the problem of rising healthcare costs is that the consumer is separated from the real price. Unlike when you buy groceries, most patients never really see the full price of their healthcare. Most people get their healthcare insurance through their employer and they have no idea what the employer is paying for that insurance. They don’t see how it impacts them. You may believe that the cost doesn’t affect you because it doesn’t come out of your paycheck. But in reality, it does. The more your employer pays for health insurance, the less is available to pay you increased wages. 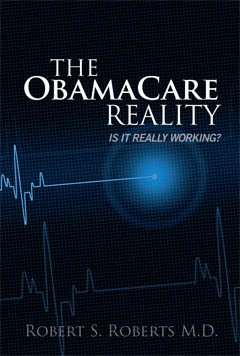 ObamaCare has raised the cost of health insurance coverage for employers and thus has lowered the wages, and potential for wage increases, of employees. The other factor in hiding the true cost of healthcare is the tax exclusion of employer-provided health coverage. Since shortly after WWII, the tax laws of this country have excluded taxation of healthcare benefits provided by employers. This first occurred during a time of wage and price controls when employers began competing for new workers by offering health insurance. The IRS exempted these benefits from taxation – and this has continued long after the rescinding of those wage and price controls. Labor unions and employers have resisted any changes in these rules, which has enabled them to offer bigger and better healthcare benefits while avoiding any increases in payroll or income taxes. As a result, wages have remained low while expensive healthcare benefits have fueled increased healthcare spending. 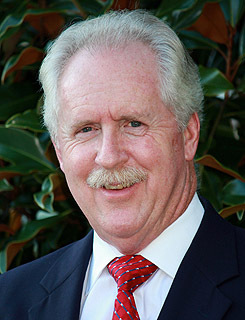 Clark Havighurst, writing in The Wall Street Journal, believes working-class Americans may be paying $1 Trillion a year too much for health care and could benefit from major changes in the way they purchase it. More understanding of this truth might persuade voters to hold both Democrats and Republicans accountable if they fail to address this issue. 2025 this policy will result in more than $4 Trillion in lost payroll and income tax revenues. Solving this discrepancy would not only level the playing field for all Americans, but go a long way toward solving our rising national debt problem. Ultimately, solving the rising cost of healthcare must be about transparency. Consumers must know the true cost of any product if they are to make informed decisions. Medical treatment is no exception. As transparency increases, consumers will demand – and get – competitive pricing, which will lower the cost and improve the quality – as competition always does. Another informative article by Dr. Bob.